We have had ISO 9001 certification since 1997. We have also received positive evaluation of our Quality System from various Customers and this has permitted us to become a Free Pass Supplier. We have had ISO 14001 environmental management certification since 2010. 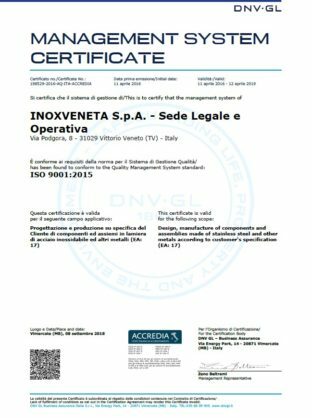 In 2008 we received SafeWork accreditation from INAIL, the Italian government body dealing with workplace accidents and occupational illness.It involves a workplace Safety Management System that complies with UNI / INAIL Guidelines and the “SafeWork” Operating Guide. The Guidelines have been drawn up to assist implementation of a Management System for Occupational Safety and Health.